Anyone who has ever had a dog knows that dogs love to run around and chase things. And unless you place them in an enclosed environment, they will run without worrying about the consequences. That means you have to worry about their safety. 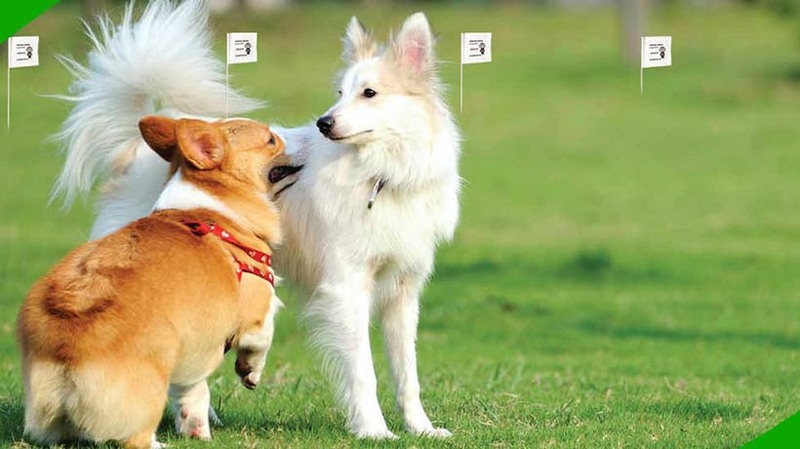 If you have a property on a busy road, or it is just too large for you to keep track, you might consider limiting your dog’s area of movement. In the past several years, we’ve seen a rise of the invisible dog fence. Basically, this is a wireless fence you do not see, unlike the traditional fence. When we talk about the best invisible dog fence, most people assume the wireless system. And that is logical, as it is the more popular. But there are actually two types of invisible dog fence, which are the wired underground, and the wireless fence. The wider system is more expensive if you have a large property, and requires more money for maintenance. In this system, fences are built underground and linked to a transmitter inside your house. This is tuned in with the dog collar. There are benefits and downsides of this system. In this system, the wireless fences use a transmitter inside your house, and it sends radio waves to the collar of your dog. Why use a wireless dog fence? Let’s be honest, you can always build a large above the ground fence around your property. But such a thing will block your view and spoil the look of your house. Another aspect is reliability. To be fair, chain fences are not very reliable. Many dogs are able to get through them, or just jump over. The market has changed to hidden fences that are invisible to the naked eye, keep your dog within a defined boundary, and do not put up a barrier on your house. With that in mind, here are some benefits of using the invisible dog fence. Many people consider these fences a controversial issue. That is due to the fact they use an electric shock to keep your dog in the fenced area. Animal rights movements consider this inhumane, due to the electrical current as a deterrent from the dog leaving the area. Overall, they are very safe. The charge generated isn’t as direct as people imagine. Instead, it is a static discharge. Think of it, as what happens when you try to get off a trampoline in your socks on a dry summer day. It is a quick snap that is surprising with minimal pain. These fences also have various settings that will ensure a lot of range for your dog, as well as some training. You can get down to a minimal shock which will be a gentle reminder that the dog is not supposed to leave the area. The most important part is that you should train your dog for using these fences. You cannot just throw one of these down and hope your dog understands why he/she is being shocked. It will take some time, effort, and training to get it right. Before choosing one of these invisible dog fences, you need to consider a couple of things. Here are some factors that can determine which one you choose. We start off with the best underground invisible system. This system is a DIY kit that comes with a strong transmitter. It will allow an unlimited number of dogs. The kit can cover an area of up to 25 acres, which is much more than any other transmitter on the market. There is also a possibility of extended coverage. You get three antennas in the kit, and 12 battery checks. You can fully customize the design and area you want to cover. The system also features electronics compatible with the new collars, one of which is waterproof. The electronics can be submerged up to 100 feet underground. 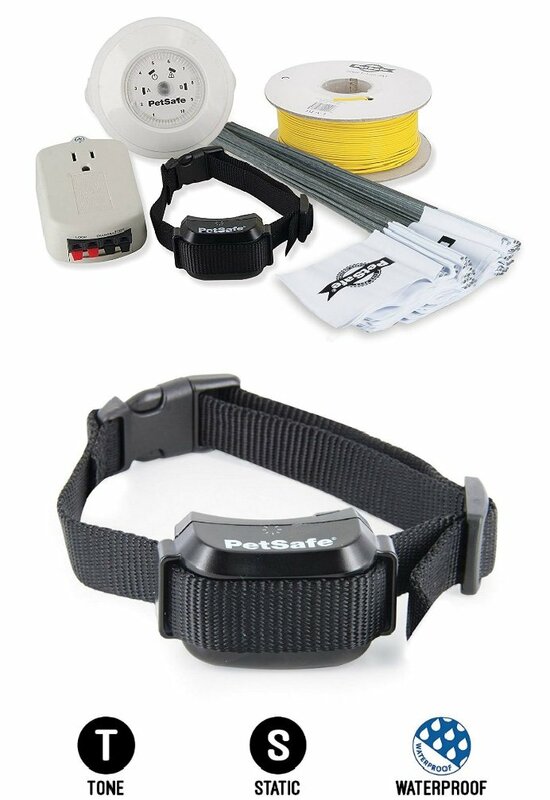 With the waterproof collar and electronics, you can even include a pond in the restricted area. While it was primarily designed for dogs, it can also contain cats, as long as you get an adequate collar. You can train your pet with vibration stimulation, static, and sound, making it one of the most humane options on the market. The collar weighs only 1.1 ounces, making it perfect for dogs anywhere from 8 pounds and up. Connect points are covered in a soft rubber covering, making it more comfortable than ever. After the best underground fence, we have the best wireless invisible dog fence. It is one of the best, if not the best wireless dog fence on the market. 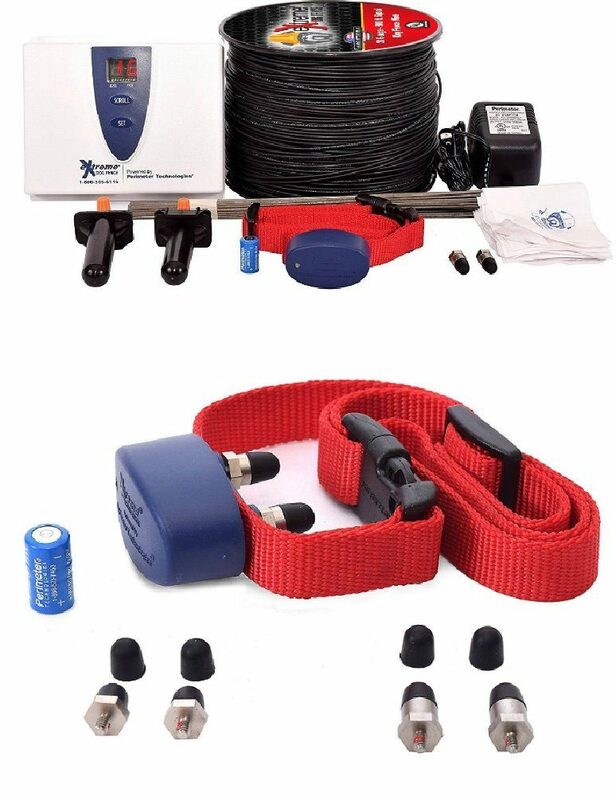 Great portable solution for a roaming dog, as the wireless signal can cover out to 105 feet in optimal conditions. The system comes with different options, including multiple collars. The collar is lightweight,and is suitable for a dog as small as five pounds. One of the best features of the system is the ease of setup, and a powerful signal. One charge will last for about three weeks, but you can easily recharge the batteries. You do not have to rush out and buy something specialized to keep things working. This rechargeable in-ground fence can work for both cats and dogs. The system covers up to 1/3 of an acre. While it is not too much, it is enough to provide a safe playground for your pets when you are not around. The system is mainly designed for people who do not have huge property. However, you can expand the limit up to 10 acres with wires and flags that are sold separately. The receiver collar can quickly recharge in just 2 hours, and lasts up to 3 weeks, depending on use. 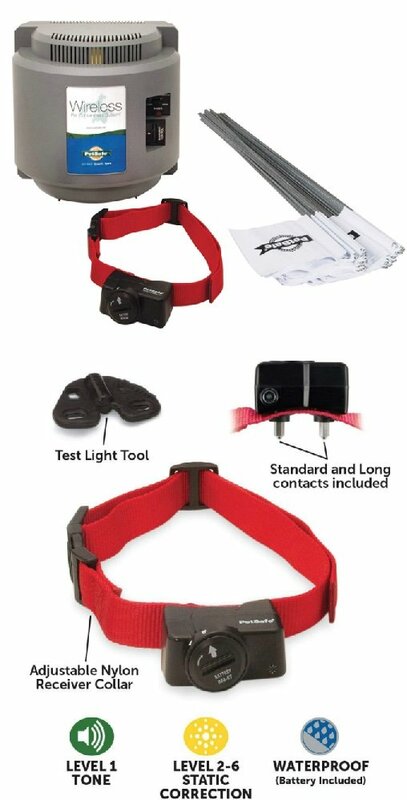 You can also adjust the collar with 5 levels of static correction and sound, and fits pets of 5 pounds and more. The neck sizes go from 6 to 26 inches. One unique feature is the two ways zone usage. The options include YardMax mode and Boundary Zone. With the first one, there is a warning zone beginning from the other side of the boundary. This allows the dog a little wider playground. Boundary zone works in the traditional way of the invisible fence, as it activates as the dog is approaching the limit. 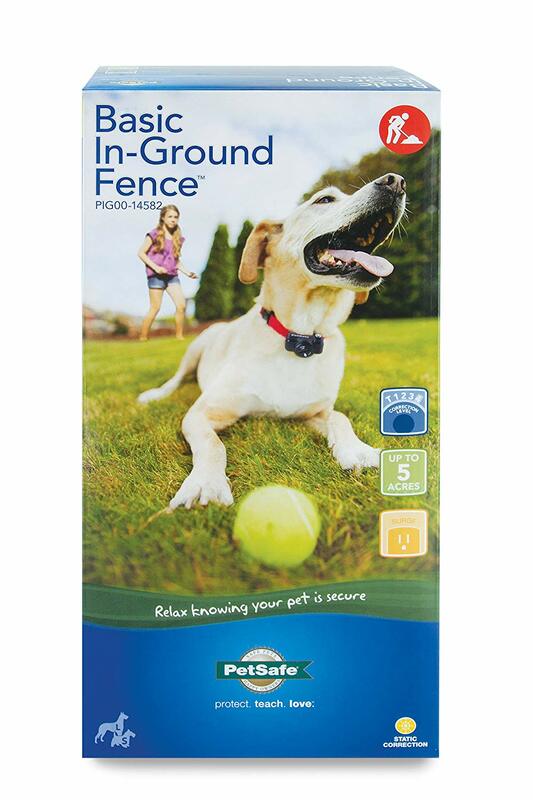 Pet Safe produces both wireless and in-ground invisible fence systems. Unlike the previous wireless system, this one comes with a single collar. On the flip side, there are extra batteries. You can modify the system of correction with five different levels of shock, or a tone-only mode that works for dogs who are well trained. The range of the transmitter is 90 feet, which is good for a property that is 200 feet by 20 feet. You can easily move it around to ensure protection anywhere on your property. The downside of the system is the signal can be blocked if you are not careful with the initial placement. This results in a couple of dead spots, where your dog can walk freely. While it has flaws, the system is great for larger properties, but make sure you have some extra batteries on hand. When you read the word basic in a product, you should not expect much. But don’t let that fool you. 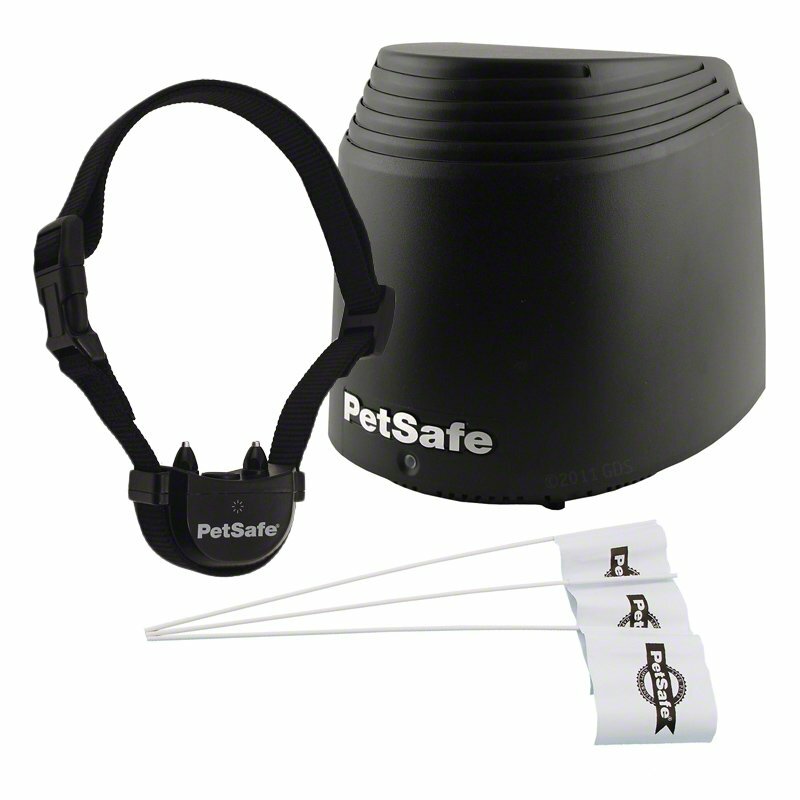 The PetSafe basic fence is an effective in-ground fence. The best part is price, as it comes at a very low compared to any other product on this list. Being cheap means you should not expect many extra features. But if you cannot afford a high-quality invisible dog fence, and you still want to protect your dog, this one comes in handy. You still get the basic features like five levels of correction. Fairly easy to install, but the wires are not super tough. Because you can run the wires any way you need, you can install it in irregularly shaped properties. The biggest downside is the connection, as the signal is not that great. While you cannot use it for large properties, this basic fence works in a regular sized home in the suburbs or town. Be sure to train your dog properly.